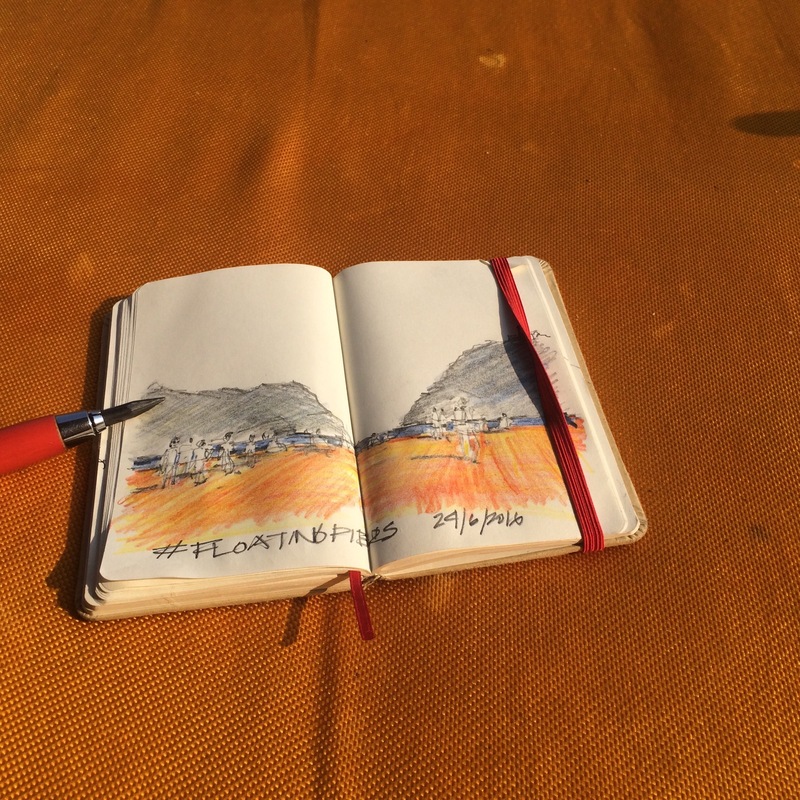 One great way of reflecting on Rome is to go elsewhere for a few days and then come back. 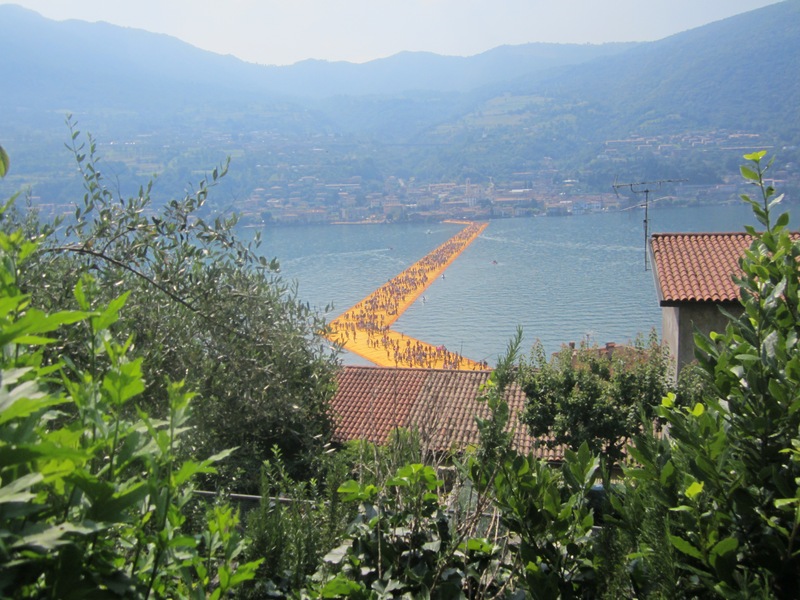 For the past couple of days that place has been Brescia and Lake Iseo, site of Christo’s latest site-specific art work, Floating Piers (and I’m writing on the train back toward the Capital). I was joined by my friends Brian and Malaya, rendezvousing in the beautiful but tragic Piazza della Loggia, with its elegant Renaissance stone porticos which reminded me of Verona, Padova and Venice. 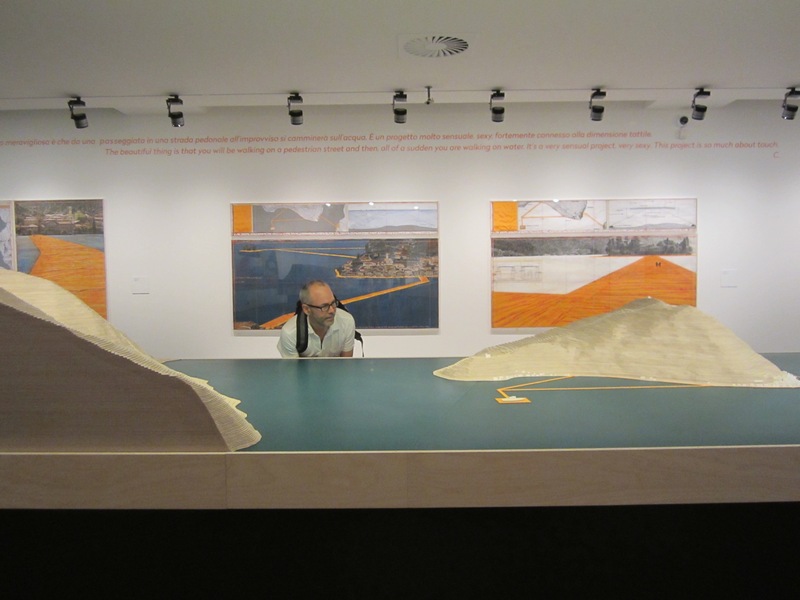 We had coffee near the site of the terrorist bombing of 1979 and then headed off to the spectacular exhibit on Christo at the Santa Giulia museum. 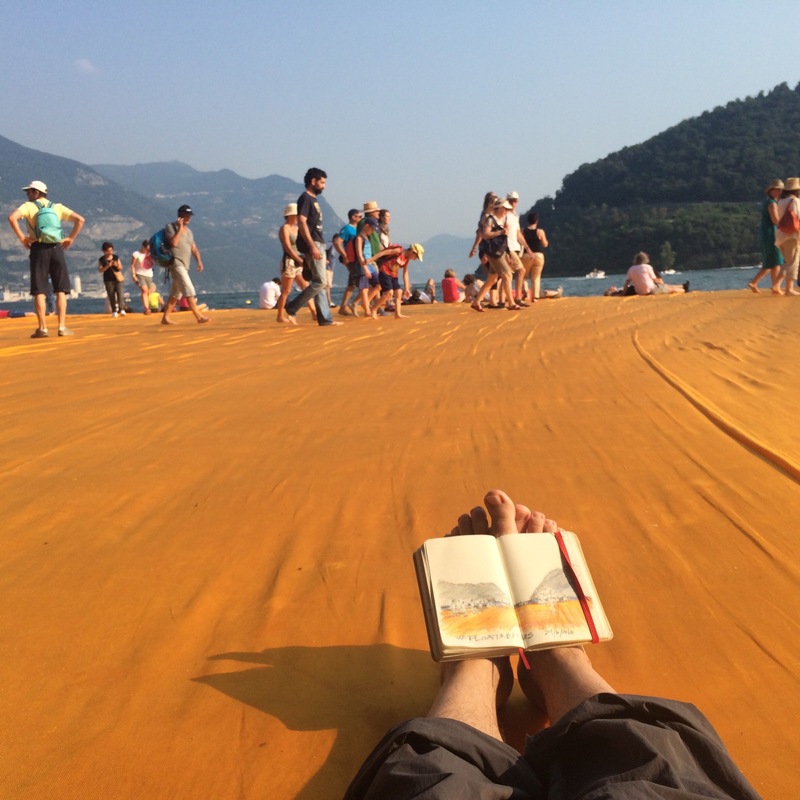 I can’t imagine having gone out to Floating Piers without first seeing the drawings, models, and videos in the show curated by Germano Celant (who also acted as Project Director for the project on Lake Iseo). The logistics of arrival had us concerned — I had been modifying my plans hourly based on reports of closures and crowds — but after seeing the exhibit we decide to drive over and see what we can do. From that point we follow the crowds, on the slow-moving motorway, then in the sad peripheral parking areas, and in long hot line to get on the last shuttle bus of the day (an emergency measure announced moments before we arrived). Watching from the bus window I am reminded of scenes of exodus from ecological catastrophes, groups of people walking along the side of the road, trying desperately to talk their way through checkpoints. But these folks are drawn to a great event, not escaping devastation. If they wanted to, they could have stayed home. 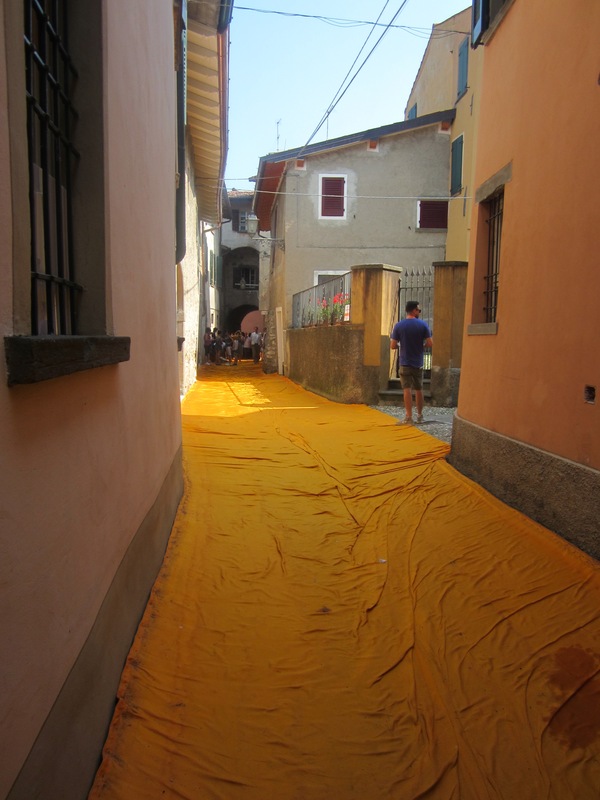 We arrive in Sulzano and are in a line, snaking around barricades, unsure of what lay ahead (which is why I am sharing these details, to enlighten you who go next). The line continues past the concrete government building where there is a second barrier, then that is opened periodically releasing people to another shorter line at the jumping off point for the piers. It took us about 45 minutes all in all from getting off the bus to kicking off our shoes on the platforms. 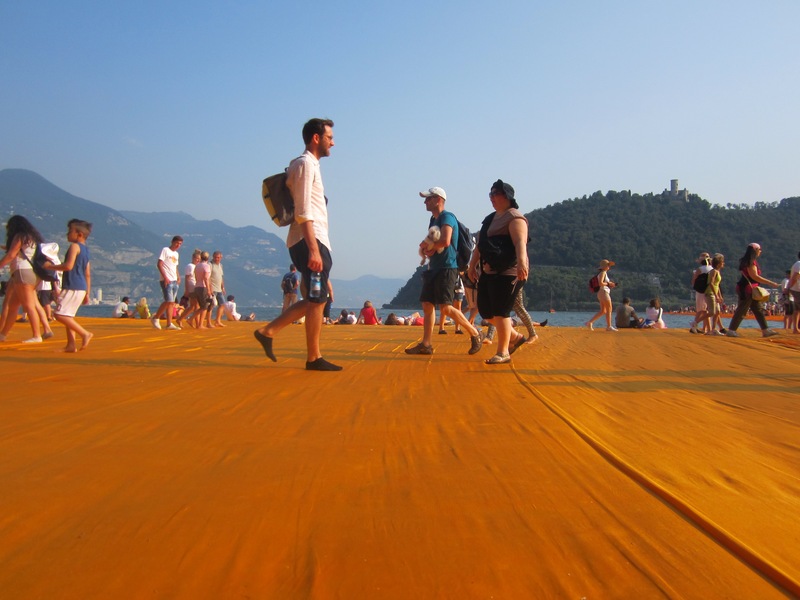 By the time we set foot on the walkway, the sun is just setting behind Monte Isola, adding to the orange and yellow tones of the fabric on which we were walking. The atmosphere was festive and calm. Staff distributed flyers (I learned later that one could ask them for fabric swatches) and kept people from getting too close to the edge. Red motorboats patrolled the waters quietly. Arriving at the island, we put our shoes back on and search for a place to eat, following a “trattoria” sign and the indications of a woman at a window which leads us on a strenuous climb which is rewarded with panoramic views and less-than-satisfactory food; nothing but cold sandwiches, hot french fries and cheap wine. By the time we descend it is dark and loudspeakers announce that the bridge to Isola San Paolo is now closed. We once again throw ourselves into the mass exodus of shuttle busses and navigation which gets me back to my AirBnB in Brescia and my friends back to their flat on Lake Garda. While I was glad at having made it to the project, I am not completely satisfied. In the wee hours of the next morning I wake up, pack my things, and head to the train station where already at 5:30 there is a crowd forming to catch the 5:55 train to Sulzano. I know the ropes, head right to the line to enter and find it moves faster this morning. Soon I am on the piers again, now in the early morning light. This time I jog(!) 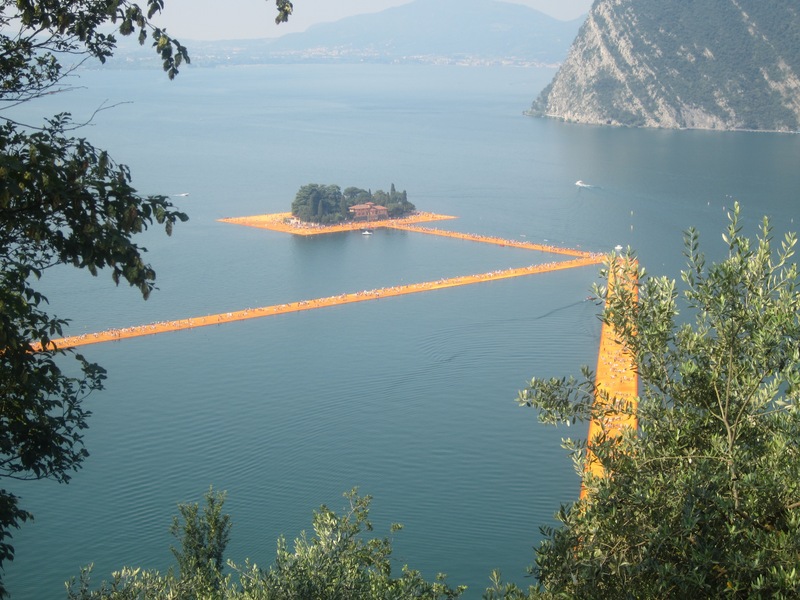 right to the island and follow the fabric until I am on the bridge to the tiny Isola San Paolo (private property once belonging to firearm magnate Beretta). 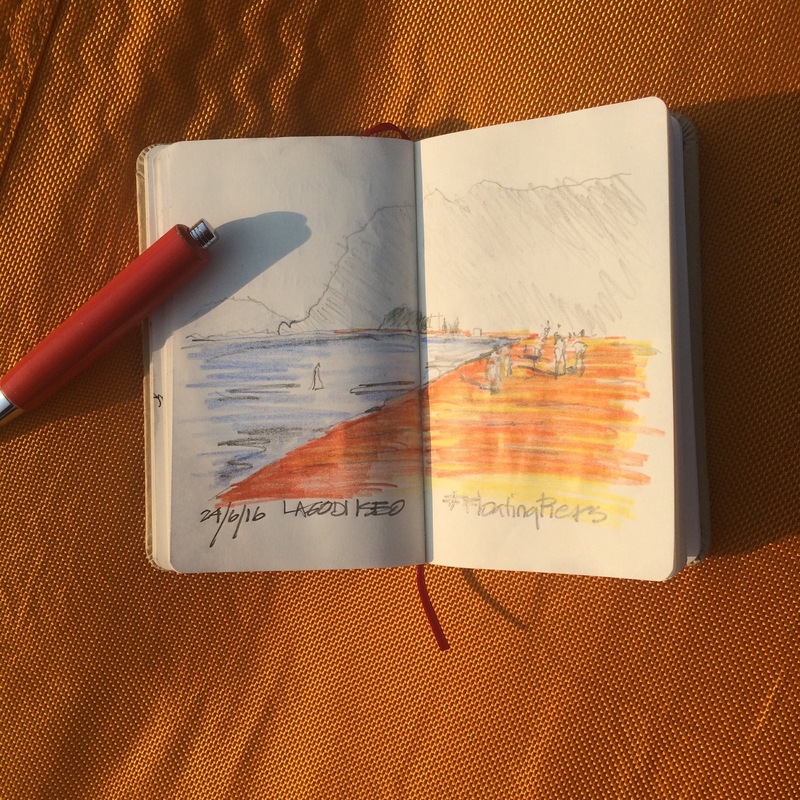 I stop to sketch, I take lots of photos (definitely the main attraction for most), and even take a nap in the shade on the island, rocked to sleep by the gentle waves. Later I hike the panoramic trail high above the lake, catching spectacular vistas as I wonder just how much further until I finally reach the “trattoria” we had eaten at the night before and descend into the streets of Peschiera Meraglio and back to the mainland. 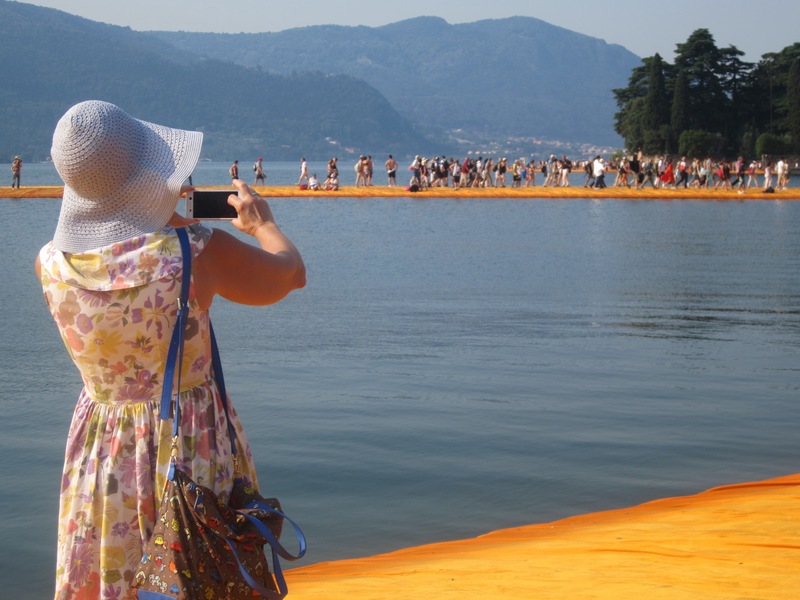 I leave with greater respect than ever for the work of Christo, a respect amplified and informed by my own participation in a massive (though by comparison practically insignificant) project with William Kentridge and Tevereterno in Rome. What a vast undertaking, from the permitting to the engineering, from the fundraising to the logistics and security. The teamwork that must have taken place is formidable. And in a few weeks it will all be over, just a few billion giga of media files, some beautiful (and valuable) drawings, and most importantly the indelible memories of those who participated in the saga. Is it worth it? 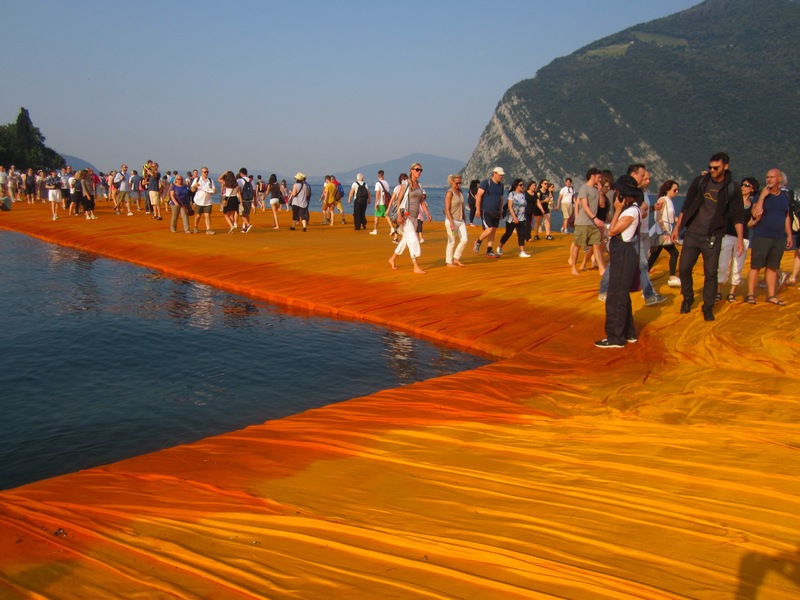 The question can be asked of any work of art really, but in the case of site-specific works, whether urban transformations like the High Line or land art like Christo, Richard Serra or many others, is that it adds value to places of daily life. The artistic projects, and the people that experience them, are all integral to the place, and even when the work is gone the transformation is irreversible. 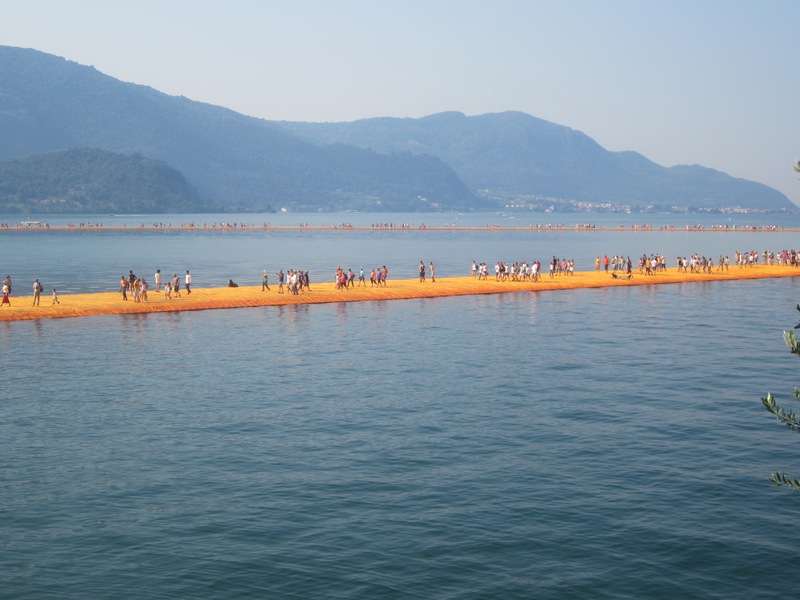 Like all art, Floating Piers wasn’t necessary, it didn’t do anything, didn’t solve any problems. 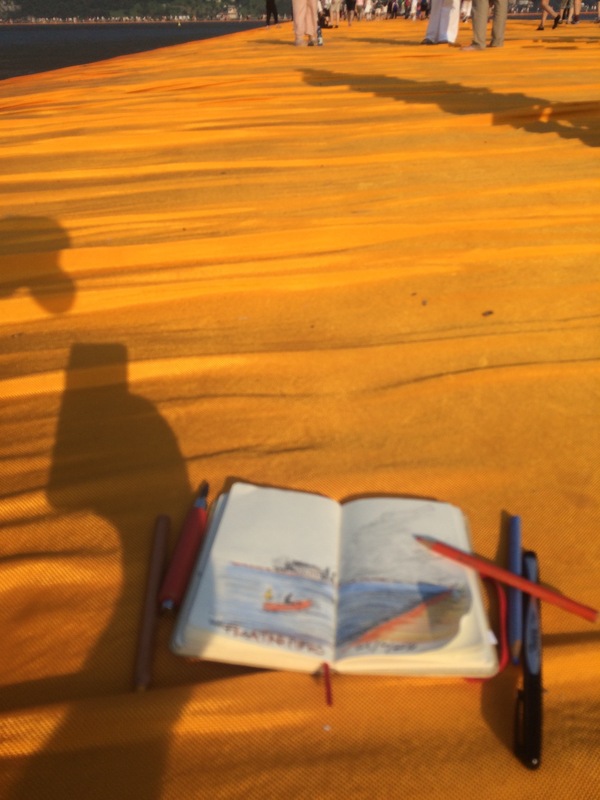 It simply filled a void which might otherwise be filled by even more useless and invasive enterprises, adding to collective experience and knowledge.